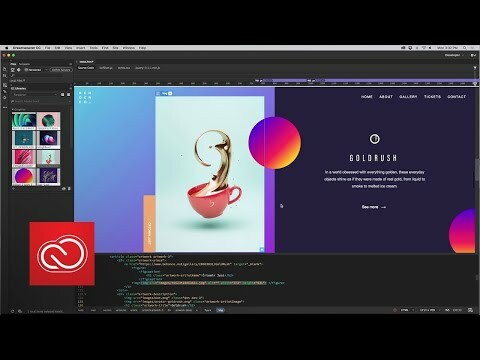 With this software users can browse and access colors, graphics and other creative assets in Libraries that are available in Dreamweaver and other Creative Cloud apps. Assets can be linked so that when one is changed, the team can choose to update it across any projects where it is used. Libraries make it easier to organize and manage your projects. One can find, license and manage royalty-free images and vector graphics from directly within Dreamweaver. The user can choose from assets, save selection to Creative Cloud Libraries and then drag it into project to use. One can also license video assets directly from the Adobe Stock marketplace. Responsive websites can be created easily that adapt to any browser on any device, with the help of integration with the latest version of the Bootstrap framework. New visual aids help to define breakpoints for different screen dimensions and organize the code - it is all within Dreamweaver. Coding can be done more efficiently with Emmet support that turns simple abbreviations into complex HTML and CSS code, and real-time error checking with Linking. The user can also edit HTML embedded within PHP files in Live View. Adobe Dreamweaver also includes simple starter templates which helps beginners and students to build great-looking websites, and more. Includes 100GB of cloud storage your own portfolio website premium fonts and social media tools. Q. How do I download and install Dreamweaver? You can download Dreamweaver from the Creative Cloud apps catalog. You'll need to sign in with your Adobe ID and password to complete the download. For more information, including how to install older versions or check for updates, see Download and install Creative Cloud apps. Q. Why won't Dreamweaver install? Q. Can I install Dreamweaver on another computer?